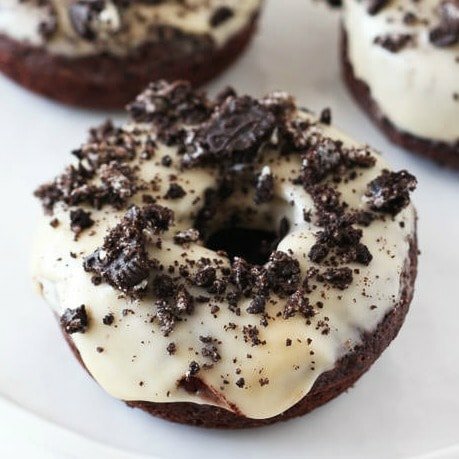 Cookies and Cream Chocolate Doughnuts have a baked chocolate fudge doughnut, an ultra thick sweet icing, and a generous sprinkling of crushed Oreos. Taste: Sweet and chocolaty, a perfect indulgence! 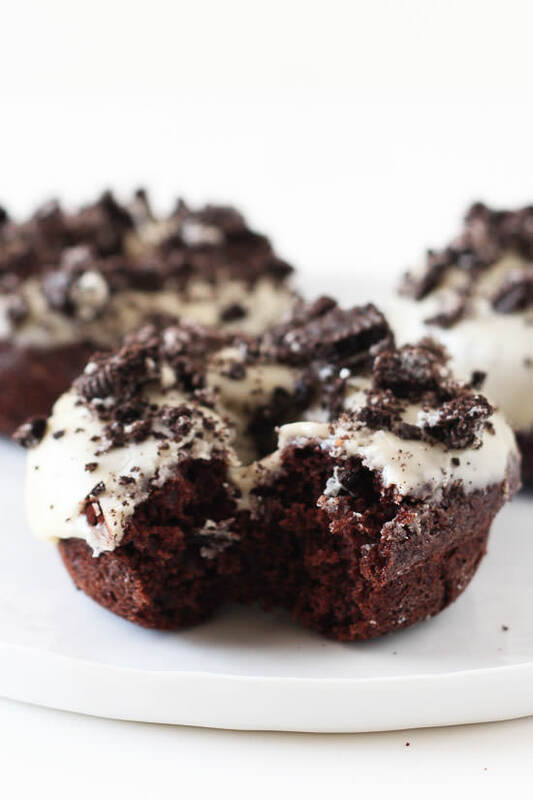 Texture: The doughnuts are perfectly moist and fudgy yet soft, the icing is ridiculously thick, and the Oreos on top add a wonderful crunch. Ease: Much easier than making a yeast dough and deep frying it! I love baked doughnuts because they take less than an hour to make. Appearance: These just <em>look</em> crazy good. Pros: Fun and tasty twist on the doughnut, plus they’re simple to make. Cons: None, really. Would I make this again? Of course! Though there are many more doughnut variations I want to make. 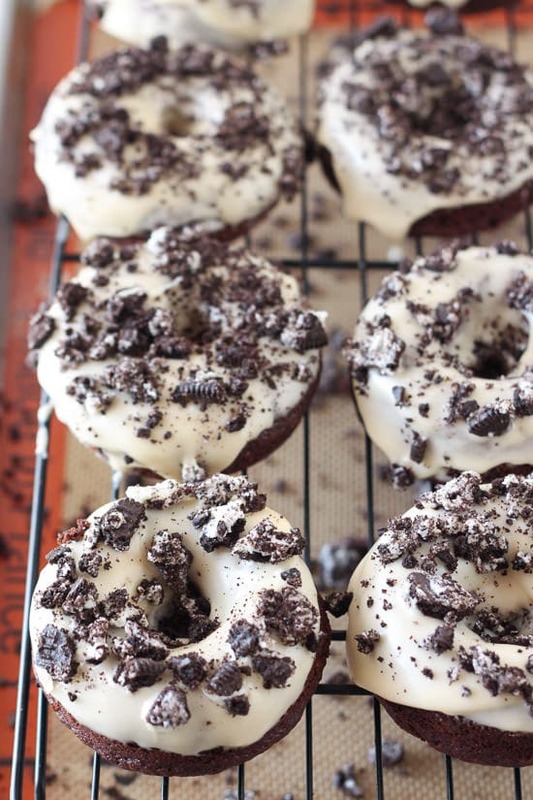 I dare you to make these Cookies and Cream Chocolate Doughnuts without anyone in the house noticing. Just the sight of these over-the-top doughnuts is bound to get your mouth watering. If you do manage to whip up a batch of these doughnuts (they take less than an hour!) be sure to enjoy one on the couch while watching some trash TV with a glass of cold milk nearby. It’s really the only way they can truly be savored. You’re going to love this recipe because not only are the doughnuts baked instead of fried, seriously cutting down on your time in the kitchen and on the indulgence factor, but they just taste like heaven mixed in with a sprinkle of childhood memories. I mean, who didn’t love Oreos growing up? I used my beloved Wilton doughnut pans to bake these. They’re super cheap on Amazon but you can also find them at stores like Michael’s and Sur la Table if you don’t already have them. If you make this Cookies and Cream Chocolate Doughnuts recipe, be sure to take a picture and tag it #handletheheat on Instagram. I LOVE seeing your photos! Preheat the oven to 350°F. Lightly greasy two standard 6-cavity doughnut pans. In a large bowl, whisk together the cocoa powder, flour, sugar, baking powder, baking soda, and salt. In a medium bowl whisk together the eggs, milk, vanilla, and vinegar. Add to the dry ingredients with the melted butter and stir until combined. Scoop the batter into a zip-top plastic bag or piping bag, cut a hole in one corner, and pipe the batter into the doughnut molds, filling about 3/4 full. Bake for 12 to 15 minutes, or until a toothpick inserted into the center comes out clean. Let cool in pans for 2 minutes before flipping the pans upside down over a rack to remove the doughnuts. Whisk together the sugar, milk, and vanilla until smooth and combined. The mixture will be very thick. Dip the tops of the doughnuts in the icing or use a spoon to spread a thick layer. Sprinkle with crushed Oreo cookies before letting set for about 20 minutes, or until the icing is slightly hardened. Serve or store in an airtight container at room temperature for up to 2 days. You may microwave the doughnuts for 15 seconds before serving to refresh. Oh. my. goodness. Those look iNCREDIBLE! 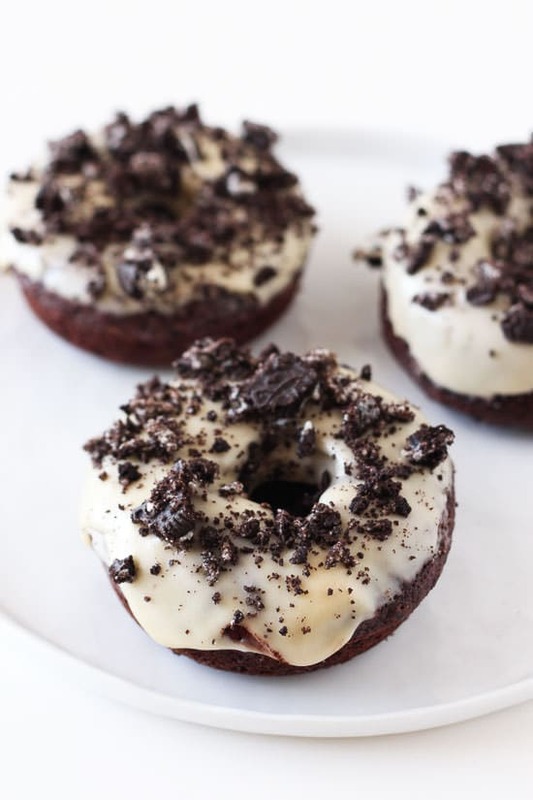 I’m typically not a huuuge fan of donuts (it’s weird, I know), but I love anything with oreos, and I’d love to have one of those for breakfast right now! This recipe looks so easy and delicious! One thing, though. The ingredients are not displaying as a list, rather, they appear as a paragraph, making it much harder to read. In other recipes you’ve posted, the ingredients are in list form, so I’m wondering if there was a formatting snafu during the final step of posting. I tried opening the link in both Chrome and Internet Explorer, and it appears that way in both browsers. It also doesn’t change when I click on the print button. This is my kind of breakfast Tessa!! You make the best doughnuts. Hope you have a great weekend! Tessa, your donuts always look so amazing! Love these! Donuts!!! I could eat these for breakfast, lunch and dinner! Pinned! Oh I’m ready to eat one (three?) of these while watching Bachelor in Paradise (my current guilty TV pleasure!). Over the top amazing, I need these this weekend! My gosh. I think I need these in my life immediately! These are beautiful and I can’t wait to try them. What an easy recipe! We also like them with smarties and it’s delicious. Donuts are generally favorite in our family so I’m very thankful for a smart way to do them. Very simple and tasty! Ohhh I just saw a picture of doughnuts with smarties and it looked perfect. I’ll have to give that a go the next I get my hand on smarties. Why 2-6 pans and not one 12? I’ve never seen a 12-cavity full-sized doughnut pan, and I used to work in a kitchenware store! I made these last week, and then I finally blogged about them today [Here, if you’re interested: http://www.darciebakes.com/2014/10/baked-cookies-n-cream-chocolate-donuts/%5D! They were amazing. 🙂 Thanks for the recipe. Would you recommend using sweetened or unsweetened cocoa powder? Only thing is that regular fried donuts take literally TWO MINUTES to fry and two minutes to either glaze or dip in icing. It doesn’t take 20 minutes for one batch. I was trying to find new ideas for the donut shop but this would take too long.